Blink and Bertie, a photo by aghrivaine on Flickr. This weekend we went and looked at a beautiful house in the hills, and brought Blink with us. He had a hard time with something in the yard of the house, and started eating grass and any plant he could get his mouth around. He threw up a few times, which was kinda nasty - I've also never seen him do this before. 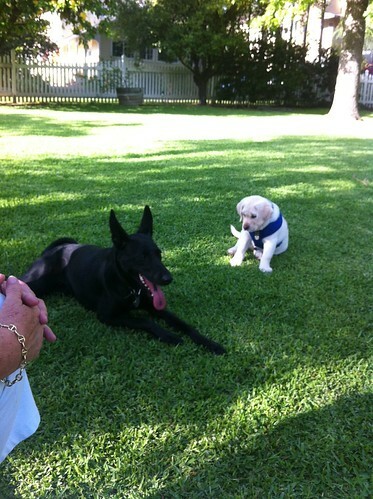 It seemed to pass, though, and this was the second time that my parents-in-law new puppy, Bertie Wooster met Blink. He seemed a little freaked out by Blink's yarfing. After investigating the house, which we liked very much but probably can't afford after someone else made a bid on it, we went back to the La Canada house and Blink and Bertie played in the yard. Bertie "gets" the idea of fetching a ball already, which is pretty amazing for a ten week old puppy. We had to teach Blink the fetch game, and however much he has taken to it with wild abandon, he really didn't at first even though he was a year old. So that, and this picture, which clearly demonstrate that Bertie is pretty dubious about Blink, seem to indicate that he's a really smart dog. Oh my goodness, they are SO cute!